UK-based sports specialists FaulknerBrowns Architects, in association with Canadian architects, Hughes Condon Marler Architects (HCMA) from Vancouver and Dub Architects from Edmonton, are delighted to be working on design proposals for an innovative community recreation centre with an indoor cycle track for the city of Edmonton in Alberta, Canada. The project was secured through an open request for proposals in the summer of 2013. The design team’s mix of community-focus and elite-sports expertise was the key to winning this high profile commission. 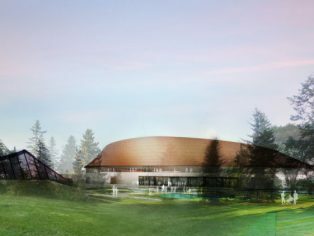 The Community Centre will be only the second major indoor cycle track facility in the whole of Canada following directly from a facility currently under construction Toronto, which is to be used for next year’s Pan Am Games. Edmonton’s Community Recreation Centre includes a 250m Olympic standard timber indoor cycle track, a sports gymnasium, 4-lane indoor running track plus a range of additional community recreation facilities including children’s play rooms, health and fitness and multi-use studios. 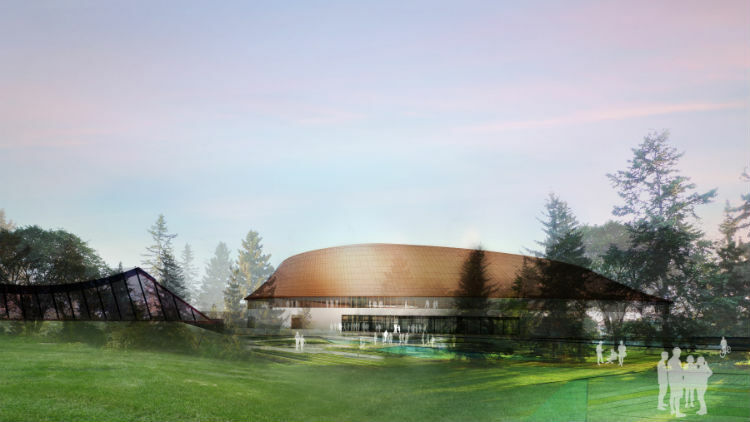 The new building will be situated in Edmonton’s Coronation Park and will be connected to the unique and much-loved Peter Hemmingway 50m pool with a subterranean link from the new combined entrance hall. A particularly unique feature of the design is the strategy whereby the cycle track is raised up a full storey above the ground level floor allowing for a high level of connectivity between the community recreational facilities at ground floor, including direct views from the building entrance through public spaces and an ‘urban basketball court’, with direct physical and visual connections through to the surrounding parkland. Unlike almost all other indoor cycling facilities in the world, the cycle track at the upper level will have unrivalled visibility and views of this typically isolated sport directly from the ground floor ‘social heart’ of the building, helping to engage it fully with the Community. This is great news for the future of Canadian track cycling. Coronation Park was originally opened by Queen Elizabeth II in 1957 and contains a landscaped setting based on the Royal ‘sceptre’, as well as a planetarium building which has fallen out of use, and which is due to be reprogrammed to provide a new focus in the park. Also nearby is an early work of Canadian Architect Douglas Cardinal.